Tim Osboune is a journalist who likes going to gigs. A fortunate combination. 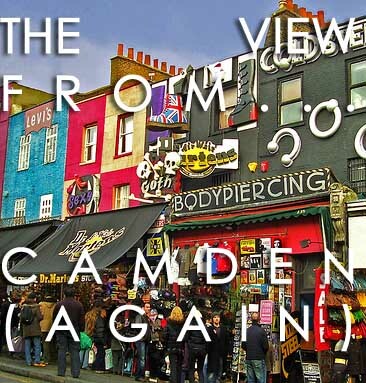 Camden Town in London scores highly in the hipster stakes as a small melting pot of fashion and music culture that has bred international superstars like Amy Winehouse. That said, the music scene around Camden is often criticised for its plethora of pretentious post-superstar bands trying to cash in on the ‘all-eyes-on-us’ feel of the place. But fear not, for there are still a handful of no-nonsense rock bands who are taking the heart and soul of Camden nationwide. If you’re someone who spends a lot of time at The Wheelbarrow in Camden it’s likely that you’ll have come across the trio called Them Changes. The band hosts a regular night called Hooligan Soup at the venue once a month, inviting other bands to support them. They describe themselves as a “psychedelic space punk power trio” with huge guitar riffs broken by great harmonies and vocal ranges. It’s a set-up that’s earned them a local reputation as ‘the next Kings of Leon’, a fair comparison when listening to their recently-released track Lie To Me. Then there’s the extraordinary Tom Cawte and David Thornley who front the band Babeshadow. Babeshadow have been regulars in Camden since their formation last year, a pair of modern-day renegades of sorts; an anti-modernist calypso-pop outfit that fits perfectly into the London indie scene with their Buddy Holly inspired sound… and they’re letting the music do the talking. This means, shocking as it is given the current state of the music industry, until recently there has been very little to see or hear of the band without making the trek to London to see them perform live. Despite having already been signed to LuvLuvLuv Records and toured with Florence and the Machine in November they appear to be rejecting much of the modern hype machine and social networking and simply concentrating on creating great tracks. Their fresh, laid-back style of guitar plucking makes their new EP fresh enough to stand-out from the crowd. The lead track ‘Sea Serpents’ has won national airplay and, for reasons that are somewhat unclear, seems to be a hit on many shop playlists in supermarkets and beauty treatment outlets as well. Camden locals FC-20 are another fine embodiment of the very spirit of Camden as a cultural melting pot with tracks that are heavily influenced by reggae, electro rock, ska and rap among others. The five-piece band only formed last year but are already calving a reputation for themselves locally in the area as a Happy Mondays influenced, no nonsense band with a ton of attitude. The boys have already supported fellow-Londoners, The Rifles, at various gigs including The Roundhouse and are regulars at The Monarch in Camden. Their live set is an electrifying mix of punkish screaming vocals and dubstep infused indie beats. It’s an odd, but winning combination that seems to have raised a few eyebrows among the locals. Posted on July 10, 2011 by Joe Sparrow. This entry was posted in Featured, Headline, The View From.... Bookmark the permalink.